"Give us a bash of those bangers and mash me muvver used to make . . . . ."
This week's recipe came about after a request for it from sx-pat Susan C who has recently moved to New Orleans and misses a taste of home. I must admit to missing being able to purchase them also but I have found that this recipe does come reasonably close. Of course, not everyone will have the tools, etc to actually make the full sausage: stuffing the mixture into casings, etc. So do as I do when I am short of time - take the mixture and make them into patties and shallow fry them. It does lack that joy of cutting and biting into a sausage but one does get the flavour! The email from Susan, sent me on a quest for information about various sausages - types, names, descriptions and what they are made of - see How to make Sausages. This will also give you acceptable alternatives should the sausage you look for not be available. Very apt considering this week's column, my students will be busy completing a butchery module next week, while I am off to judge in the New Zealand national Salon Culinaire (cooking competitions). So I am may not be here next week, I was planning on writing the column ahead of time, but the sausage quest, took more of my time than I thought. But I hope to have some great photos of some of the top New Zealand chefs' winning dishes to share with you the following week. Until then, get into these sausages and feel free to email me if you would like other sausage recipes, or would like to me cover any other areas of cuisine in upcoming columns. Remember I am here for you, to answer all those gnarly culinary conundrums that have been bugging you. Earlier this year, I was emailed by someone in the States, who had such a question about New Zealand wildfoods. It now transpires he and his young family are winging their way to New Zealand for a holiday. I will be meeting up with them on July 8th when they arrive here and look forward to sharing some of the wonderful Kiwi cuisine and wine . . . so it just goes to show what can transpire from a single email! 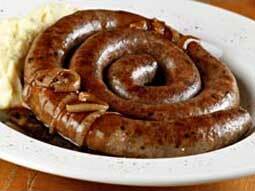 Enjoy your Cumberland Sausage and bon appetit . . . . .